How to get there: Drive Hwy. 7 from Bergen to Nordheimsund, turn right on Hwy. 550, there are signs for Jondal. Park left of the lane that serves the ferry. There is no need to take the car across as the trailhead is quite close to where the ferry arrives. 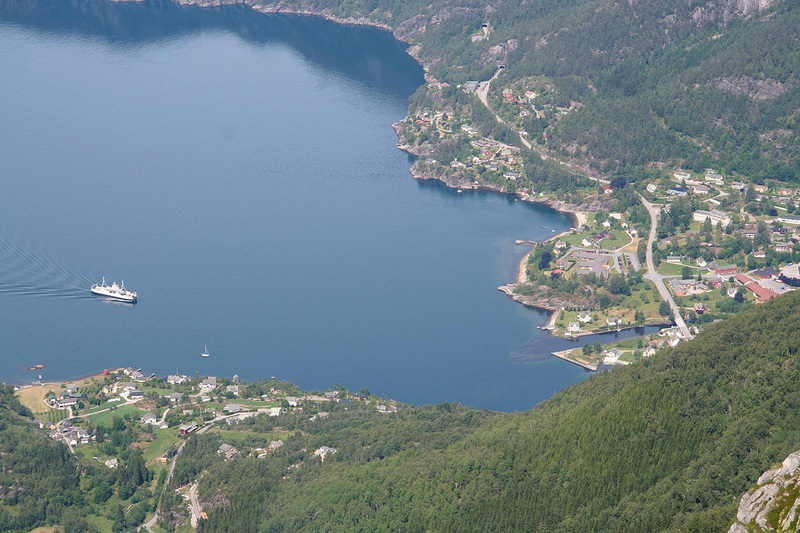 Take the ferry across to Jondal. In 2009, the fare was 34 NOK. You hike will start from the ferry. Route description: Exit the ferry and get onto the main road that goes right (south, then west). This road climbs a gentle hill before making a left turn approaching the creek that comes down Renndalen. A small road forks left (uphill), immediately after this road, there is a sign with the names Vikanuten and Fjellstøl also pointing uphill. This location (the actual trailhead) is at N60:16.277, E006:14.591, elevation about 50 meter. Follow this trail uphill. First, through some grass then into the forest where the trail becomes more clear. The trail is marked with red paint and the normal "T". After a short section of uphill, you arrive at a trail junction. 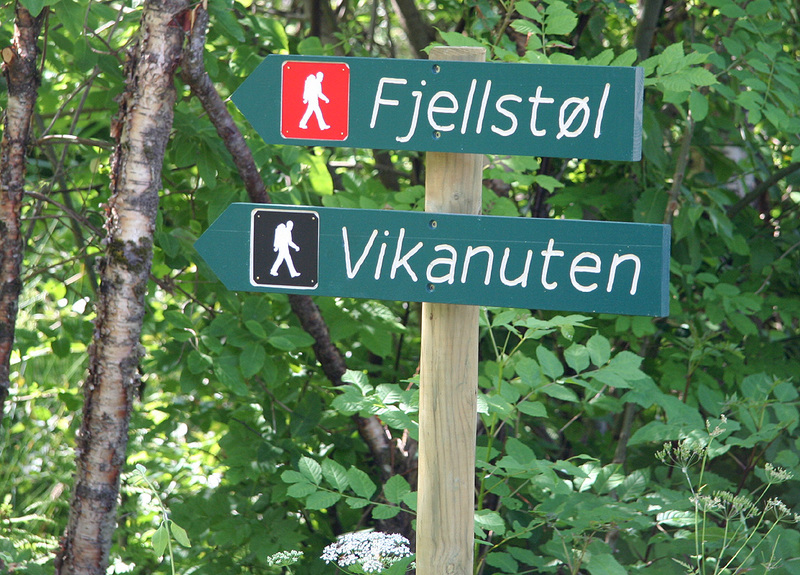 The trail to Fjellstøl goes left, while Vikanuten has a sign going right (crossing the creek). The two trails form a nice loop hike. I would recommend going via Fjellstøl on the way up, then take the somewhat more direct trail back down from the summit. The Fjellstøl trail continues fairly steeply uphill, then gradually traverses more left and the slope eases. You arrive at Fjellstøl when you have climbed 600 vertical meter. 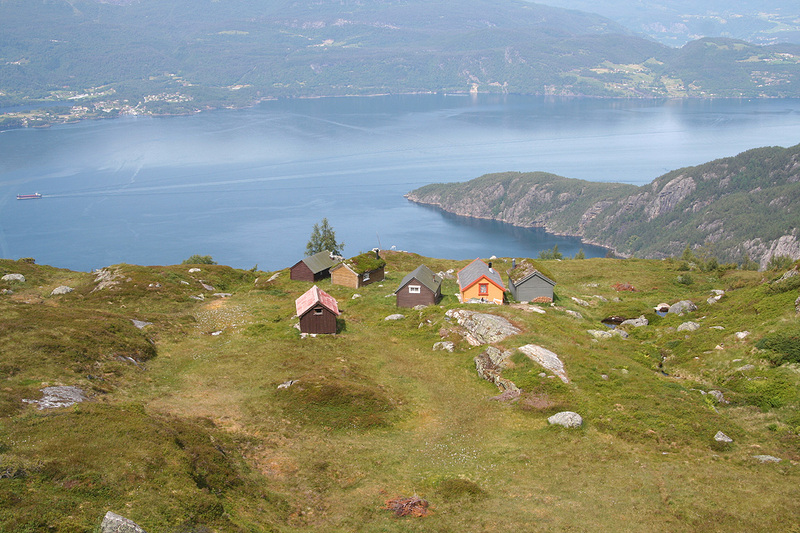 These small cabins are located at N60:16.168, E006:16.014. There is a pretty good view back down to Jondal, just a few meter below the buildings. 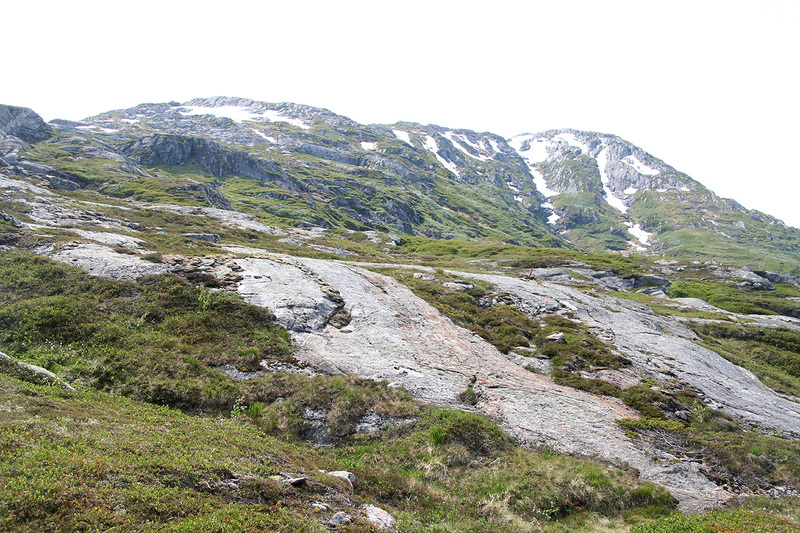 From Fjellstøl, the trail continues (now above the treeline) and is well marked with red paint. The Vikanuten mountain has a fairly large plateau and it may appear a bit longer to the summit than what you first believe from looking uphill. There is a west and an east summit separated by a shallow gully. The east summit is slightly higher and marked with a minimal cairn. The return trail runs down from the west summit. 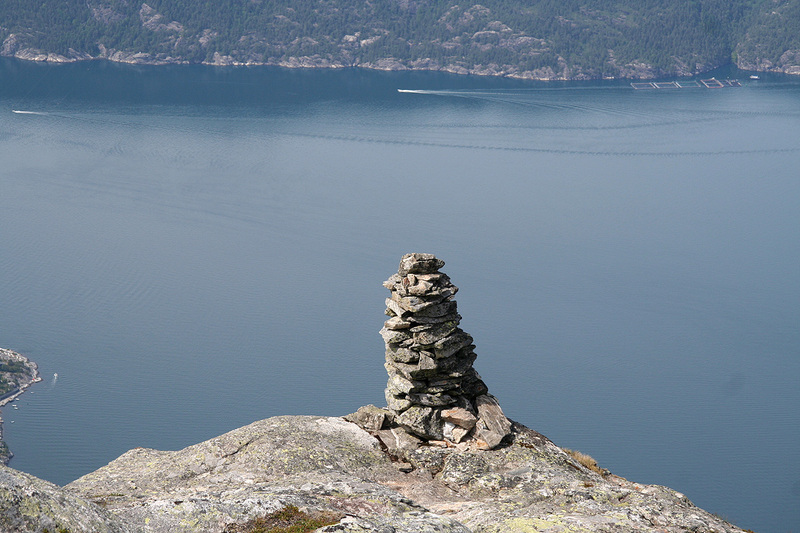 Just as the terrain gets steeper, there is a nice cairn at a good viewpoint overlooking the fjord. This trail si also well marked all the way down to the trailfork described earlier. Comments: This Sunday came with warm summer weather, few clouds and around 25 Centigrades. I drove from Bergen about 10 minutes before 1000, arriving almost perfectly just as a ferry was about to leave for Jondal. I realized that the best approach would be to park the car, then take the ferry without it. Thus, I started hiking from the ferry in Jondal at 1140, locating the trailhead around 1150. I arrived at Fjellstøl at 1240. A nice location with a good view. After a brief stop, I continued uphill, reaching the highest summit in another 45 minutes at 1330. The views were quite good all around. Folgefonnen glacier being completely white, while the rest of the mountains had scattered patches of snow only. After 15 minutes I headed across to the west summit and shortly thereafter back down. I almost stepped on a ptarmigan on my way up, otherwise this was a quiet hike. I met only one other hiker on this nice trail on a truly nice summer day. I arrived back at the ferry around 1505, just perfect for what turned out to be a 1510 departure. 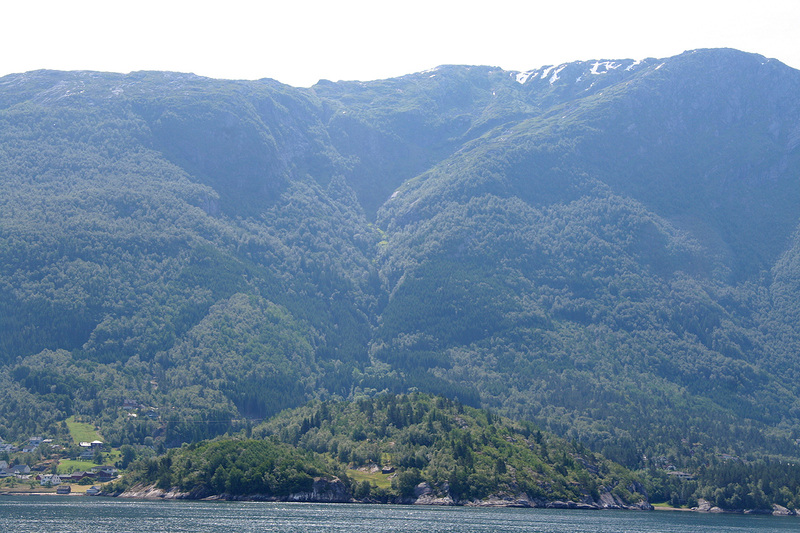 Vikanuten, as seen from the ferry. The summit is a bit further behind. Trail sign, this is at the trailhead. 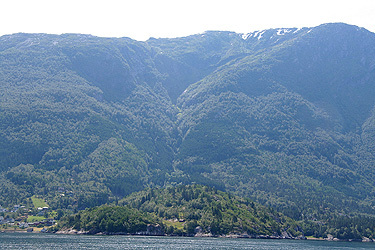 Fjellstøl, 600 meter above the fjord. 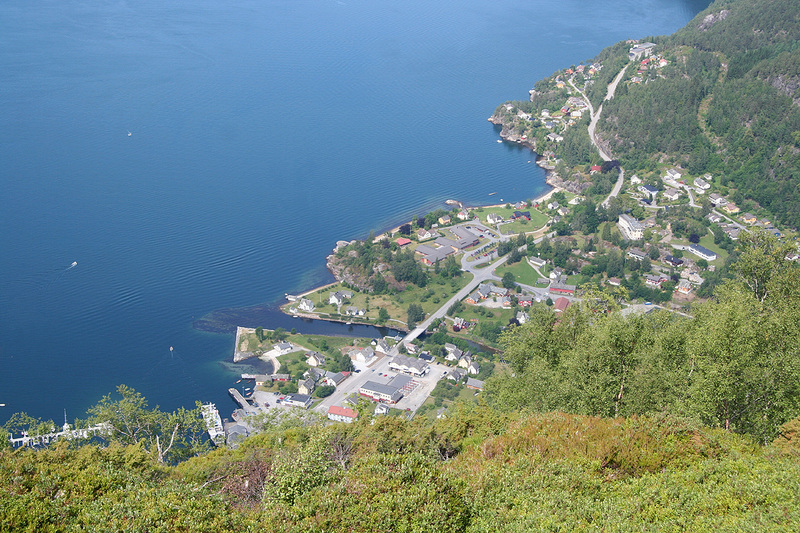 Jondal, as seen from Fjellstøl. 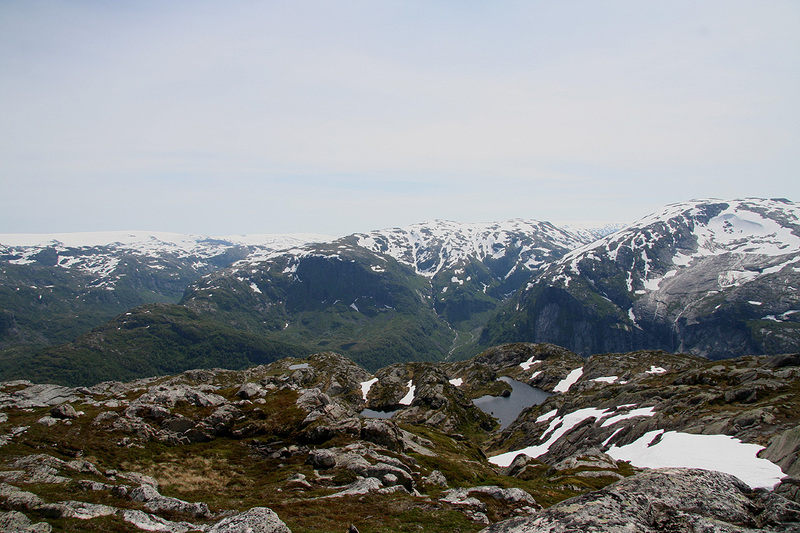 Between Fjellstøl and the summit. A cairn overlooking the fjord about 1000 vertical meter below. Jondal, as seen from near the summit of Vikanuten. 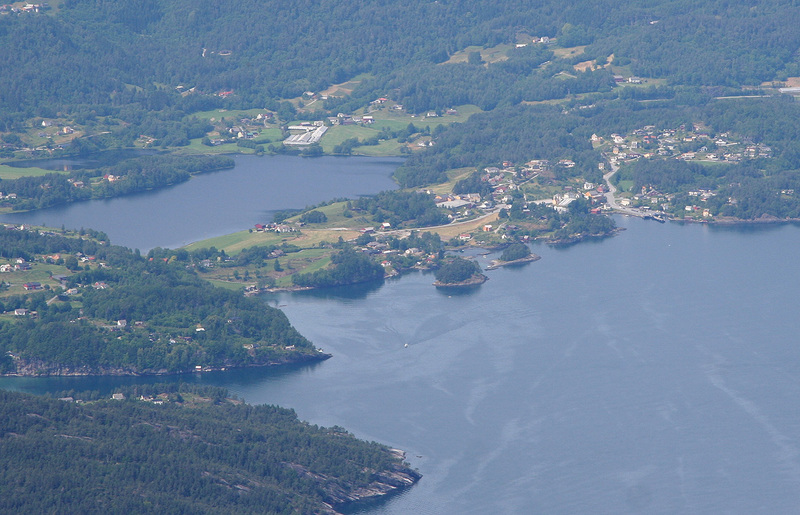 Tørrvik, as seen from Vikanuten.